The Europe injectable drug delivery technology market is expected to register a CAGR of around 11% during the forecast period of 2018-2023. Injectable drug delivery technologies allow the transport of drugs formulated in liquid form and facilitate the rapid transport of the drug into the body. They also help administer drugs in unconscious and comatose patients. Due to their advantages of faster onset of action with high efficacy, these delivery systems are widely accepted. Additionally, due to the increased prevalence of cancer and diabetes, the market has registered growth in the recent years. Some of the most common chronic diseases include - heart disease, stroke, type 2 diabetes, obesity, cancer, and arthritis. According to a report by OECD/European Commission, in 2016, around 550,000 premature deaths across the European Union were attributed to chronic diseases, including heart attacks, strokes, diabetes, and cancer. As the adoption rate of injectable drug delivery devices is high among the population suffering from diseases, like diabetes and heart-related disorders, the increasing prevalence of chronic diseases is expected to contribute to the growth of the injectable drug delivery technology market over the forecast period. The convenience of handling syringes and the automation of dispensing the drug in exact proportions are also contributing to the growth of the market. Injuries and infections caused by needles are acting as major restraints for the global injectable drug delivery technology market. The European Biosafety Network estimated that in 2007, there were more than 1 million needle stick injuries annually, in Europe alone. The WHO has estimated that these numbers are expected to increase by at least 20%, over the next five years. Moreover, there has been an increase in the number of infections caused by needles over the past few years. Therefore, with the increasing injuries and infections caused by needles, there is a reluctance among the population to use injections, thus hampering the growth of the global injectable drug delivery technology market. The growing use of alternative drug delivery methods, along with safety concerns associated with the use of injections, are restraining the market. 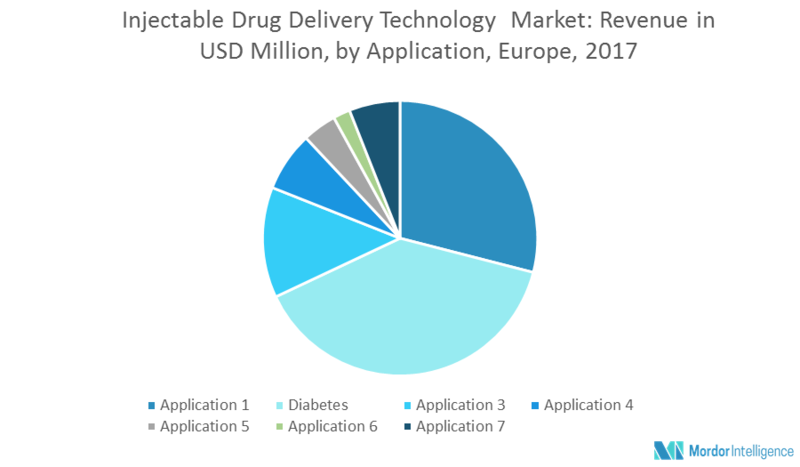 The German segment of the injectable drug delivery technology market accounted for the largest share in 2017 in Europe, due to the increasing prevalence of chronic diseases, such as cancer and diabetes in this region and technological advancements. April 2017: BD (Becton, Dickinson and Company) and C R Bard Inc. have entered a definitive agreement. Major Players: Baxter International Inc., Becton, Dickinson and Company, Eli Lilly and Company, Gerresheimer AG, Schott AG, Novatis AG (Sandoz), MicroCHIPS Inc., and Pearl Therapeutics Inc., among others. Current and future Europe injectable drug delivery technology market outlook in the developed and emerging markets.